Looks like there’s some redemption for those who mercilessly beat a partner and drag her out of an elevator. Apparently you get to work with high schoolers. 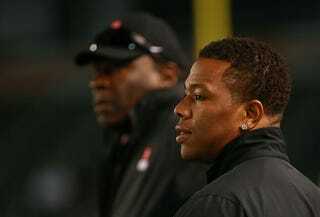 Ray Rice, barring a dramatic set of miraculous circumstances, will never play for the NFL again. Or at least that’s the case with disgraced NFL running back Ray Rice, the former Baltimore Raven who was unceremoniously dumped by his team after video of him fighting his girlfriend in Atlantic City, N.J., emerged in 2014. Rice, who is now married to Janay Rice, the woman in the video, was taken on as a volunteer assistant running back coach at his former New Rochelle High School in Westchester County, N.Y., on Friday, the Journal News reports. Rice, 30, has been working with the team in an unofficial capacity for the last three years as he fights to regain his reputation. Though there are reports that Rice is keeping in shape, no team has taken him since he was reinstated in the league in November 2014. New Rochelle head coach Lou DiRenzo, who coached Rice from 2001 to 2004, was nonchalant about Rice’s new role. “Nothing has really changed,” said DiRenzo. “Ray’s been volunteering and mentoring these kids and training these kids and coaching these kids and on the sidelines on Saturdays. He just happens to have more time in his schedule now. These days, in addition to coaching, Rice speaks to college and professional football players against domestic violence. Last month he visited rookies from the Tampa Bay Buccaneers and is scheduled to visit the Notre Dame football team later in June.